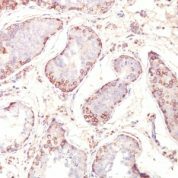 Recognizes a protein of 42-46kDa, identified as MAGE-1. 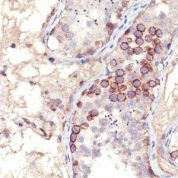 This MAb does not cross-react with MAGE-2, -3, -4, -6 -9, -10, -or -12 protein. Human malignant neoplasms carry rejection antigens that are recognized by the patients' autologous, tumor directed, specific, cytolytic, CD8+ T lymphocyte clones (CTL). The MAGE family of genes codes an important group of antigens. It was identified that melanomas, primary glial brain tumors express common melanoma associated antigens (MAAs). Because MAGE-1 is expressed on a significant proportion of human neoplasms of various histological types (melanoma, brain tumors of glial origin, neuroblastoma, non-small cell lung cancer, breast, gastric, colorectal, ovarian, renal cell carcinomas), not on normal tissues, the encoded antigen may serve as a marker of early detection, target for cancer immunotherapy. 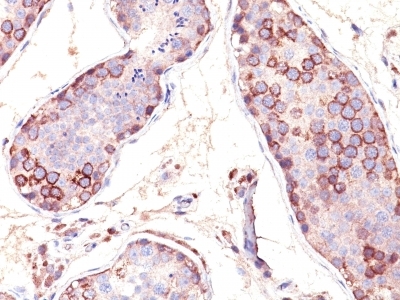 Anti-Human, Rat, and Canine MAGE-1 Positive Control Sample: Melanoma cell lines. Melanomas, gliomas, neuroblastoma, non-small cell lung cancer, breast, gastric, colorectal, ovarian,, renal cell carcinomas.